The Volvo estate has been around for more than 35 years. Modern day versions are more refined and stylish. The latest version is the V70 a much more attractive and all-round appealing vehicle. The only problem is the competition offers similar vehicles with similar levels of equipment and sometimes better levels of equipment. Volvo will not be able to depend on the loyalty of buyers familiar with the company. The firm will have to stay one innovation ahead of the competition in order to tread water in the highly competitive premium estate sector. The V70 like all Volkswagens comes with a high level of safety as standard. The newest safety device is the Blind Spot Information System (BLIS). This system alerts the driver to other cars and motorbikes in his or her blind spot. This is just the latest in the company’s long line of safety features. A second-generation version of the Four-C active chassis system is available as an option on the V70. The driver will be able to choose between ‘Sport’ and ‘Comfort’ settings. Volvo is offering a good deal of equipment to tempt buyers away from the big German brand. Volvo’s new commitment to style and premium quality must have the competition’s attention. Prices are reasonable for V70s especially considering the space and versatility that’s provided. The 2.0-litre T engine isn’t the most exciting to drive, but the car should get reasonable insurance rates. The car gets decent fuel economy, and enjoys high resale values. The car offers good space and practicality. The rear seats fold to add extra storage space when needed. There is plenty of room for the legs and heads of front seat passengers, but taller passengers in the rear will not have good legroom. The car’s displays are clear and easy to read. The car’s main controls and dials are functional and well thought out. The car’s switch gear isn’t the most stylish, but it all works well and has a quality feel. Everything is located where you would expect it to be. The cabin successfully suppresses most road and engine noise. The car’s seats are comfortable, and the car itself provides a smooth and enjoyable ride. The car performs especially well on the motorways. The car provides wide door apertures, and allows for easy access to the car’s cabin. The driver’s seat adjusts to every position imaginable and should accommodate most drivers. Access to the cabin’s rear seats will be a little more difficult, but all but the tallest person will find plenty of room once inside the cabin. The V70 is an easy car to park, thanks to the high driving position, good visibility and light steering. The bonnet is difficult to judge, but parking sensors are available on the options list. The Volvo V70 wasn’t designed for speed. All V70 models reach 60mph in under 12 seconds and top speeds range between 124mph and 155mph. The Four-C (Continually Controlled Chassis Concept) chassis with its Sport or Comfort switch is designed to give buyers a choice between a sporty ride, or a more comfort oriented ride. The V70 would make an excellent family car. With its van-like stowage capacity and reliability it has a lot to offer a family. The car is likely to attract younger buyers as well as more mature buyers. The car’s style and price will appeal to a younger crowd than previous models have. 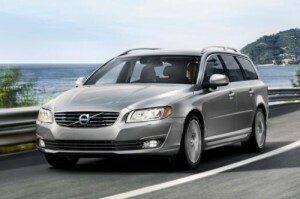 The V70 also offers loads of safety features that is sure to be appealing to families. The V70 is not a likely family car. The purchase price will run too high for most first time car buyers. Insurance rates are likely to be too high for younger drivers, and the car will not be the easiest to maneuver and park, especially for novice drivers. Volvo is known for its exceptional build quality and impeccable safety credentials. The V70 embodies both principles, and the car’s interior boasts a quality that is associated with more luxurious cars, such as the BMW 5 Series Touring or the Mercedes E-Class Estate. The car’s exterior looks durable and sturdy. The V70s standard security system includes a standard remotely operated alarm, an engine immobiliser, and VIN plates as well. The car comes with many airbags fitted as standard. The car also comes with SIPS, WHIPS, ABS, DSTC, TRACS, and IC. BLIS is a good idea, and the system is offered as a cost-option. The best choice for a car stereo is the optional high performance audio pack with six-disc changer, four, 75-watt amplifiers and 11 speakers is truly excellent with great sound quality. There is little or no distortion at high volume, and steering wheel-mounted controls are very convenient. Silver and dark blue look the most flattering on the car’s exterior design. Buyers have the choice of either aluminium or wood trim detailing for the car’s interior. Volvo’s V70 is an attractive estate with plenty to offer buyers. The car is second to none in safety, and the company has managed to add on a few new safety innovations as well. The Four-C chassis lacks any real bite and this may deter some buyers. This entry was posted on January 3, 2018. It was filed under Uncategorized.